Do you decorate for Halloween or do you just keep your fall decor up? I’ll be honest, I’m not a huge fan of Halloween but some of the decor and crafts are just too cute! I have a few things planned for this year and I’m sharing my first one today. 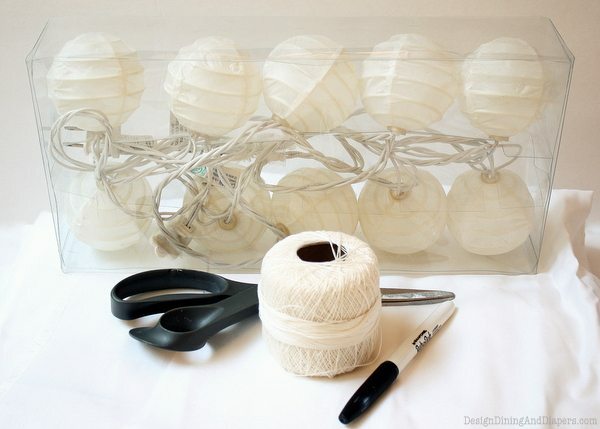 I’m slowly getting in the Halloween spirit around here by sharing an easy way to spruce up your porch or mantel with these Illuminated Ghost Garland. 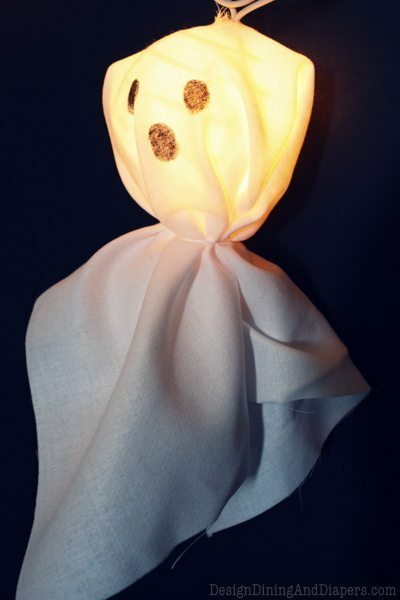 …Flip on the switch to see the ghosts light up for your visitors! Boo! And believe it or not, it’s super simple to make. Cut ten 14″ squares. Fold them into a triangle and cut the tip off to create a hole in the center of the square. Carefully remove the lantern from the light. Thread the light through the hole in the square piece of fabric. 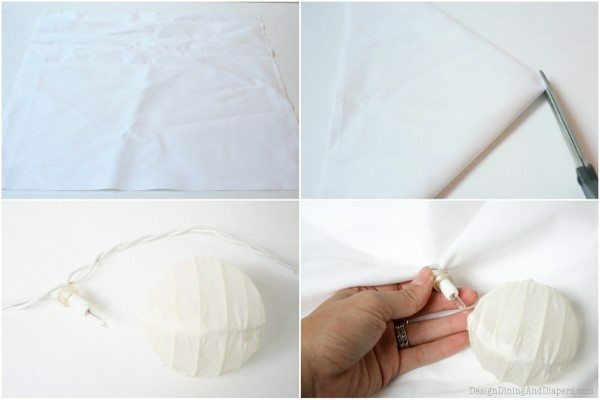 Carefully secure the lantern back in place and wrap the fabric around the sphere. Tie a piece of string around the bottom of the sphere to hold the fabric in place. Using a sharpie, draw ghostly eyes and a mouth! And you are done! Where would you put your little ghosts? Being the Halloweenie lover that I am, I always decorate to the 9’s! 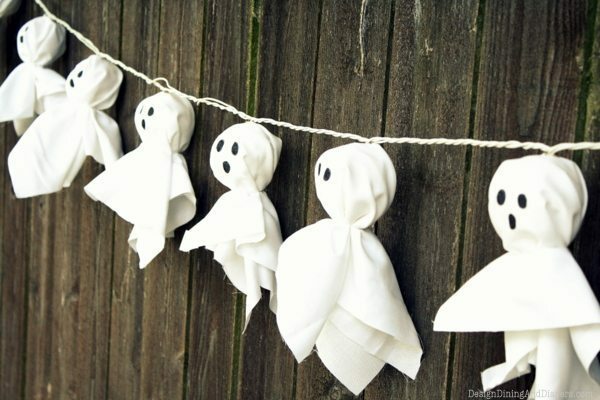 This is such a fabulous idea and these little guys will look perfect hanging down my stair railing for my annual costume party! I love this – so cute :) Thanks for sharing. AWESOME!!! Just Awesome!! I love it…. Clever girl! What a cool idea! Such cool idea! They really look cute! I came here from Frugal Friday. Okay, I am totally making this tomorrow! I love, love, love this! Thanks so much for sharing! I am stopping by eighteen25’s Halloween party! I am your newest follower BTW, love your blog! So fun and spooky cute! These is so simply adorable. What cute little ghouls. I just love the tutorial as well. Would you link this up to our Down Home Blog Hop? So cute and such a fun idea!! Love it! Cute! That’s such a good idea with the mini lanterns, it might be fun to do a big ghost on a bigger lantern like that. If I find any on sale I will definitely be doing this! Thanks! What a great use for the patio lights I just took down- thank you! They are so cute! I mean spooky. Scary. Abhorrent. No, really! I must get one of those battery- operated fairy light chains and hang them from my matelpiece- absolutely perfect for what I have in mind! This is great. I love that it looks equally good during the day as it does at night. Plus, it gives me a good reason to splurge on those mini-lantern lights. On the deck for summer, and repuporsed for fall! So simple and fun! LOVE these! I love it when I see a brilliant idea *and* I already have all the bits I need to re-create it. Thanks for sharing this – I’ve pinned it on Pinterest (and am your newest follower over there). This is FABULOUS! What a clever idea. Super clever and super cute!! Love this, I’m living on my own for the first time this year and I’m so excited for this Halloween and all the coming holiday’s. This will be a fun project for me and my boyfriend… I’ll make them and let him put them up ;) . This is such a fantastic project!! I’m including it in a 13 for Halloween: Decor roundup on my blog tomorrow, with one pic and a link back to this post. Thanks for sharing a great idea! 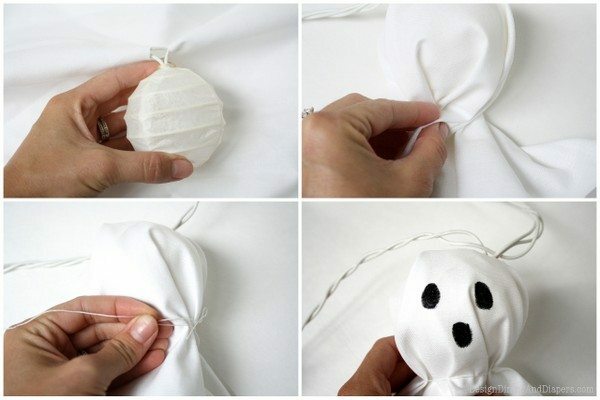 What a CUTE idea- I love these little ghosts! Adorable! Really great stuff Taryn and we’d like to share this over at ours…I’ll get you a link when it’s live. I am in the middle of constructing this and having a hard time! I am not very crafty in the first place… so the fact that I’m having a hard time is not a knock on the project itself… so I’m having a hard time threading the cloth and the lanterns because of the big white square plugs on both ends… male and female. Were you able to remove these? How did you get around them?